And before going further, from reading the COMMENTS below came the idea that I owe you, my blog visitors and many who will follow Search engines here for many more years, a fairly-updated photograph of me. The pix I’m inserting includes my significant other of 49 years who has been with me in my writing life as we’ve been together in all things; he has appeared on this blog in multiple frames, especially the ASO OKE YORUBA various categories.He’s been sounding board, suggested ideas, cut and paste – with exacto knives – in the days before PCs became common, et cetera. I had been thinking of how to get some of my old essays on to a platform where they would not only be visible to others beyond the shores of Nigeria but would be a [sort of] permanent storage without my having to compile them in a book form. One of my kids came up with the idea of a blog where I could also continue to write (if and when I felt like it) on the usual matters I’m passionate about: the arts, sportlatform mid-2010; emotan is the name of a woman’s mag I published and edited from 1977 to 1985 in Nigeria. However, the first post on this blog did not appear until March 30, 2011 when Buhari’s third quest for Nigeria’s presidency – it failed as the earlier two – before he finally lucked out on the fourth try became the catalyst to get up and make a go at my intention. In the eight years since the birth of emotanafricana.com, I have learnt as much as I’ve tried to give my reading followers from more than a total of over a hundred countries – from time to time -who stop by here for information on various subjects my perspectives on the issues that interest me without ever standing on the fence or hiding behind the proverbial one finger. It has not been a singular effort as the detailed stats of a few contributors below will show. I’ve been lucky to have these few contributors whose essays, including topical issues on Nigeria’s politics – the constitution & restructuring, especially – education sector, et cetera have resounded so well that such writings have continued to attract thousands of viewers after their initial publications. My particular thanks go to those contributors, especially Deleola Daramola whose What’s in a name: A look at some Yoruba names of birds (one of his multiple contributions), an essay that has attracted over 15,000 views during a period of about 6 years point to the singular area in which this blog seemed to have transported the blog and me. Lawyer Femi Aborisade’s The National Question and the Nigerian Constitution (one of more than a dozen contributions), has had over six thousand (6,000) views. An attorney, Femi has submitted to this blog many of the papers he regularly gives as press releases and at workshops for his committed effort on defending civil and human rights in Nigeria. Professor Ladipo Adamolekun’s Education Sector in Crisis: Evidence, Causes and Possible Remedies might have had its initial outing as text of the 2012/2013 Distinguished Lecture of Joseph Ayo Babalola University (JABU), Nigeria paper – an academic gathering – it has found a welcome platform here with over five thousand (5,000) views in the six years since its posting here. 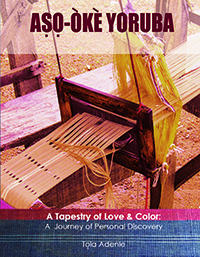 Yoruba Engagement Aṣọ Òkè which I wrote in June 2013 generated so much interest (over 22,000 views) that I developed a book out of the whole aso òkè category: AṢỌ ÒKÈ YORUBA: A TAPESTRY OF LOVE & COLOR, A JOURNEY OF PERSONAL DISCOVERY . While I will stop posting fresh material, responding to correspondences and comments on posts et cetera, this blog will remain on the WordPress platform so that those who may visit the site through search links for research or information on important subjects that have stood the test of time on the blog, can continue to access such information. I’ve gained as much – if not more – from working on a total of not less than 70% of posted essays here, as reading what others have contributed. I owe a debt of gratitude to contributors who have added variety and depth to the fares on this blog, and my thanks also go to www.wordpress.com for providing this platform at a very affordable cost and, especially the provision of these useful and eye-opening statistics that validate my effort. And last, but definitely not the least as they are the most important, are my visitors who have made this a must-visit blog. They came in from over one hundred and four countries and constitute the main reason for whatever success this blog was able to achieve. SEE TABLES & MAPS AFTER READING TO THE END. From the USA with the highest number of visitors (112,501), an impressive average of over a thousand (1,000) visitors/monthly, when viewed against a fact that the first two years-plus of the blog attracted very few visitors. AND – pardon me – others, big and small but too many to list. The top countries are listed on the three maps at the end of the other graphics. I thank you all for the bottom of my heart. Below are some selected essays among the top-ranked posts containing more details. Please note that one of above posts has been deleted. In inserting one of the selected top essays, I had omitted Aborisade’s THE NATIONAL QUESTION which now comes first. Pls. ignore the order of pasting. All the selected essays can be found in the BLUE group above. Olaniyi’s WICKED GAA … has 6,617 views while Daramola’s BIRDS’ NAMES has 15,836. One of these days when there’s time, I’ll sort out the mess and re-organize this section. Pardon the mess! TO GET THE ACCURATE FIGURES of the selected few, please use WordPress total; do not rely on my Math! WHERE DID ALL THESE VISITORS COME FROM? My sincere thanks & regards. Farewell. As I have had occasions to say, your insightful, cerebral,passionate, profound, patriotic, forthright, principled and masterfully crafted writings have been inspiring and challenging. Now that you are signing off, those of us who have been touched by your blog ,must endeavour to keep up the searchlight on those in governance in Nigeria in particular and not remain “the silent majority”, particularly as the situation seems to be getting worse in several areas. Our salvation is in our hands. God is not going to come down to help us — He has given us the intellectual and allied resources we need to ensure that Nigeria becomes a sane country in which the God-given natural resources are used for the common good. You certainly have done your bit, BUT, you this must not be a final quitting! Thank God for sustaining you for so long. I pray that your efforts will contribute to the mission to rescue this country and put an end to the criminal mortgaging of the future of generations coming after us. Sis. Bisi, dear, Mo dupe pupẹ púpọ̀ l’ọ́wọ́ nyin, Ma for the constant contributions you made through comments and ideas sent through mails to me to make this a blog that achieved the goal – and more – that it set out to accomplish as far as the Nigerian segment of the platform was concerned. Sumptuous thanks, Ma. This – like my first interaction with news and commentary-disseminating essays beginning with the DAILY SKETCH at Ibadan in the 1970s, my previous Sunday columns for two of Nigeria’s most dynamic newspapers for about 9 years in the early 2000s – may have run its course and hence has to be rested, my interest in social commentary will not end until I run out of breath! Whatever contributions I can still make that would not put deadlines – self-imposed or deserved as in the case of this blog – would continue to be made through whatever means on areas that have shown themselves as of particular importance to me. Yoruba Culture, especially her aand, especially Yoruba Ancestral Homeland, would remain most important to me, AND especially, our AṢỌ OKÈ textiles with particular reference to the older weaves. Thank you very much, Sister. Ẹ̀ ẹ́ fun wa, Ma. I have always read your blogs with interest. You have definitely made your mark which is highly commended. You imparted a great deal of knowledge to me and many across the world would have benefited from you too. You are a source of inspiration to us all. Congratulations aunty and well done. Thank you very much for these kind and generous commendation of my effort here, and for coming along on the ride through my various writing endeavors. Fortunately or otherwise, the time has come to draw the curtain – at least – on writing on this kind of platform. If anything comes along on the way even this far on the journey, you’d be among the first to know! Tola: Greetings. Congratulations on your contributions to public enlightenment through journalism, literature and the arts over several decades. You obviously found pursuing your interests through blogging worthwhile. It’s nice to read in your “goodbye” write up that you were able to reach readers in many countries across continents. Well done. Ma, you inspired me and you will forever, in my mind and other millions all over the world just like your work endures for as long as the internet exists! You have impacted lives through such medium that is sure going to outlive us. May you live long for us all. How are you and your family; hope everything is coming along well. I must thank you for the great interest in – and contributions to – my blog. I mist also congratulate you for writing an essay that got searched ALMOST DAILY, and eventually attracting the next highest viewers after the ENGAGEMENT ASO OKE which I wrote. With over twelve thousand (12,000) views in about six years, it’s an astounding 2,000 views/yearly. Not to mess up your stats, I will not attempt to reduce that to a daily average! With the interest generated in your other posts, I’d like to suggest you think of doing more general-interest writing while holding tightly to your day job at which you’ve also proved to be a success. You have my regards, and best wishes in all you undertake. Awe you have more than paid your dues, and this is to say my hearty congratulations for a job so well done, you traversed the entire world, more or less. I could hardly believe it when you informed me you were quiting writing your hard punching column for The Nation on Sunday where we were co- columnists (also with Comet) for some 8 or 9 years but I knew, without a shred of doubt, that you were heading into a bigger thing. And so exactly it turned. God be praised. I know you are headed for greater glory and I’d be eyes, and ears, to know what the next stop is. May you continue to excel Tola. Awe Femi, ‘wo se’re, o! A million thanks for your always generous words. Well, what can I say? There is time to start and time to stop! You have been a great inspirator to countless number of citizens across the globe. It was initially difficult to believe that the mind behind the ferocious pen was a septuagenerian or an octogenarian. The attached picture was even more tempting to mistaking the author of the powerful write-ups as belonging to a much younger generation. One would only be shocked upon discovering that the brain behind the powerful articles was only young incognito but much more advanced in wisdom. Your legacy is a big pacesetting for we, the younger generation, to copy. If we can be half as tenacious regarding burning issues about our motherland, Nigeria will definitely change for better. We will continue to miss your cerebral arguments. We hope that you will find time to respond to issues that may demand your words of wisdom. I must first thank you for taking the time to leave a note, and my, to quote you, ” … what can I say” in response to these very generous, kind and fairly intimidating opinion of one once described as “the tiny African girl with the big afro” by one of my bosses during my go-fer/work-for-tuition-&-food days at The World Bank in the early to mid 70s? Apart from my thanks, again, the only issue I must raise before I shut up is that the “incognito” pix was taken for my 70th a few years back; to see a more recent look – a photograph which I decided on (after reading your comments) because my readers deserve it and he has contributed to my writing life since it all started at the (Nigeria) DAILY SKETCH in the 1970s – is one of my Significant Other and me taken in 2018. I will post it with the essay by Monday. Sincere regards, and my best wishes. Thanks v. much for this. Of course you can always return to the blog and you can count on me always having those beautiful photographs and the spirit that go into creating them as my path to wsj.com! Thank you Ma. You are highly appreciated. You remain, for me, an inspiration; your tenacious commitment to principles, endeavouring to seeing Nigerian society built on positive universal values, even at old age! E o pe fun wa o Amin.